KL, Mon: YB Rafizi Ramli is an example of a young, reckless politician. A legend in his own mind who rose too fast for his own good. When you look back at his meteoric rise, you will sooner or later wonder how he got to be where he is so fast. What were his contributions to society, or to his peers, or to his neighboruhood before he was elected to represent the people in Parliament? And how did he manage to get himself in trouble again and again with the law, the same law that lawmakers like him are supposed to uphold? Ignorance? Foolhardiness? Stupidity? Rafizi did say he would not be surprised if the Court found him guilty of breaching the Official Secrets Act. Well, the truth is many of us are not surprised., either. And mind you, the courts that found Rafizi guilty today aren't the same as the ones during the Mahathir era, and the judges today are viewed by many of us as rather anti-Establishment or even pro-Opposition (allegedly, of course; in other words, they are quite fair lah). .....wait for the A-G's report. 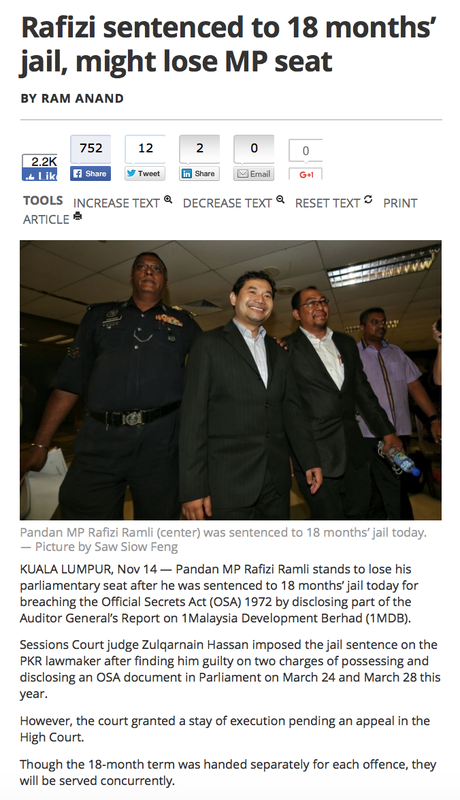 So we should thank Rafizi for having balls. And for telling us what we had a legal right to know. Journalists are supposed to have balls, too, but then it's more lucrative to decline into sipping dedak through a straw in one's old age. PS: Your pink-lipped god is really not going to win this one. First court case in Singapore, many more to follow. I guess he'll need to lock us all up to keep us quiet...the ruin of an entire country because of one fat woman's greed. Your next post - Aw, Jamal Jamban! effort, Rafizi is much better than U.
BERAPA RAMAI YANG SANGGUP BUAT MACAM RAFIZI.......???? he was punched on the nose by ZURIDAH! HEHEHEHE. He got no gut like his papa, Nik Aziz. He prefers to pray and berdoa, instead of fighting. In his life, there is no such thing as FARDU KIFAYAH. Dia cuma tahu FARDU AIN. instead of berjuang menentang kebatilan dan penipuan. So, Rafizi is wayyyyyy better than Jamal and Nik Abduh. U can AW, AW him - but deep inside U respect his gut. Lapiji Lamli boleh nyanyi manyak dalam jel.